In writing about my top 5 favorite tacos in Austin, I have to admit that some of these aren't even from traditional taquerias! Sometimes, the best things in life are where you lease expect. These appear in no particular order, just 5 spots you need to hit up NOW. 1. 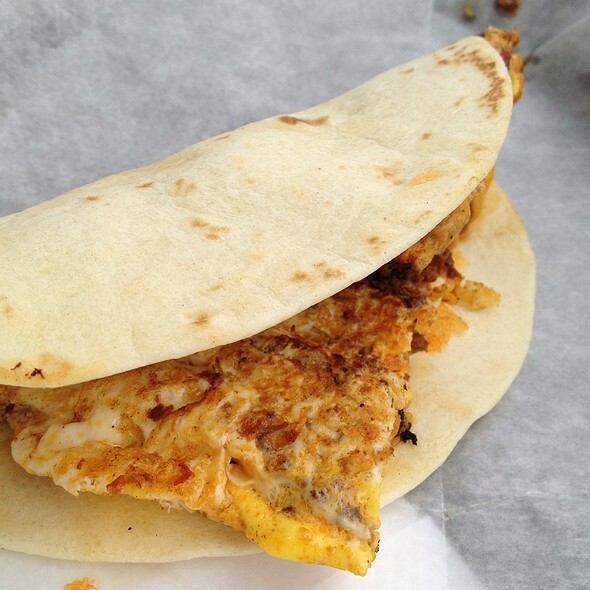 El Primo Taco Truck’s “Chorizo egg ’n Cheese breakfast taco”. This is a little taco truck that sits off South 1st Street near Live Oak. It’s in the parking lot of a mini mart and right next to Once Over Coffee. These guys have been putting smiles on peoples faces for years. Simple, street style tacos done right. The chorizo egg ’n cheese is served on flour tortillas (corn available upon request) with a lot of melted cheddar and piping hot. The perfect balance of egg and chorizo cooked together on the griddle and truly delicious. They offer a green mild sauce and a red hot sauce. I like to mix them together but, be fair warned that the red will set your lips on fire! This place made my top five because the flavor of this taco is incredible and the guys who whip up the food are two of the friendliest people i’ve ever met. They are always greeting me with a smile on their faces no matter how busy they can get. Gracias, Primo! These guys have been putting dishes together that have blown people away for the last 3 years. Located right off S Lamar across the street from the Alamo Drafthouse. 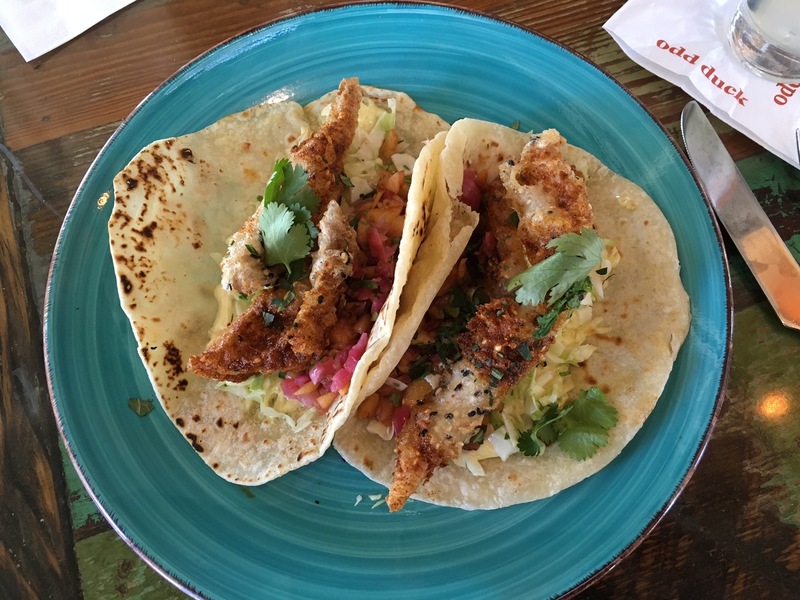 The fish tacos are a lunch menu item and they are out of this world. First off, they make the flour tortillas from scratch and the texture and flavor of the tortilla by itself is unreal. They use red fish and cover it with a light tempura style batter. The fish sits on top of a jalapeño infused house made aioli and then a pico de gallo but, instead of tomatoes they use diced up pickled pieces of onion, cabage, and peach. ‘Peacho De Gallo!’ The menu here changes with the seasons and the ingredients they use change based off of the locally sourced items that they get on a daily basis. Everything in this restaurant is made from the ground up and the integrity behind the food is real. This one is punch-you-in-the-face delicious! Another place that has scratch made flour tortillas and it makes whatever you put inside of it taste awesome. 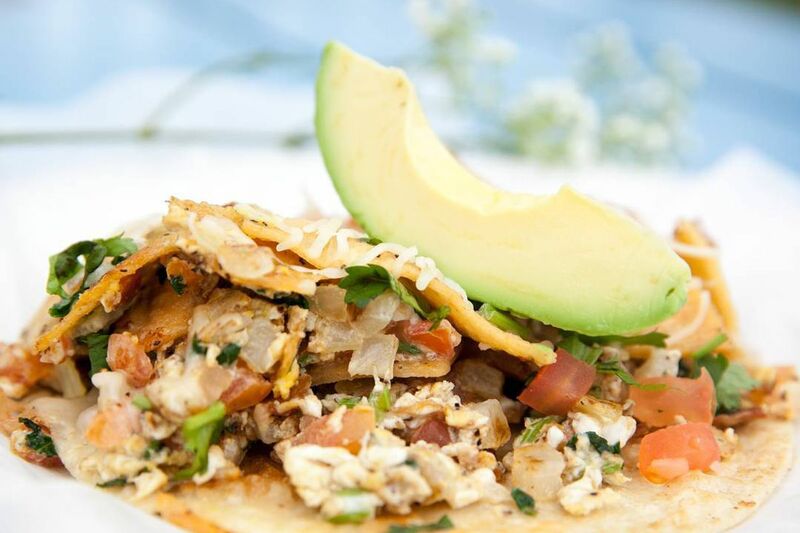 They do scrambled eggs with melted white cheese, bits of diced tomato, onion, cilantro, and pieces of the tortilla made into chips then chopped up in the mix for texture. It gives you the taste and the texture with each mouth watering bite. Two different trucks to visit: One on the grounds of Radio Coffee on Manchaca and the other off of Cesar Chavez on the east side of town. Three different types of salsa and I tend to mix a bit of all three on my tacos. Add sliced avocado to your tacos. Serious knock out! This place is incredible. A little far south off Manchaca about two miles south of Slaughter. Totally worth the drive. They do Texas style BBQ with a Mexican flare. Half of the menu is traditional Texas style BBQ and the other is a true Tex-Mex delight. The chopped brisket taco is one of the best tasting things I’ve eaten here in Austin hands down. They are another place that makes scratch flour tortillas that are incredible just by themselves. 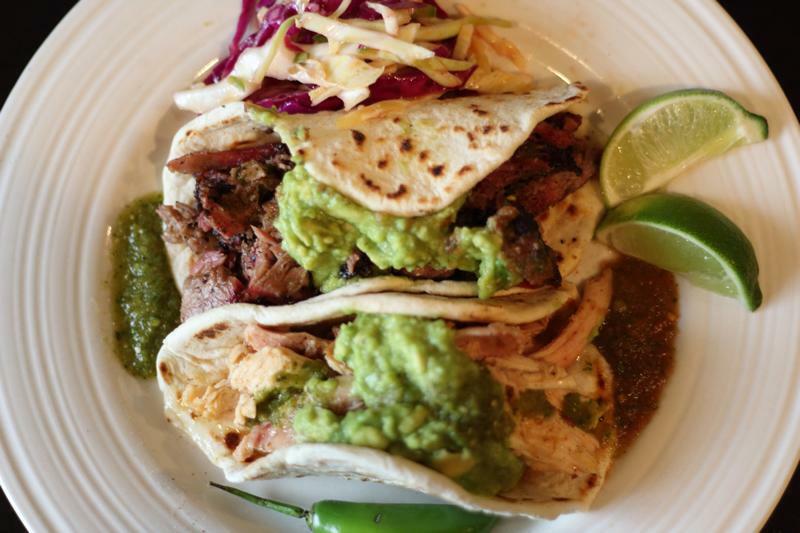 They fill it up with chopped brisket that has the perfect mix of spices and juicy flavors and top it off with a generous scoop of their house made guacamole. This thing is outrageous! Everything I’ve eaten on the menu is amazing but, the brisket taco just blows me away. Try it for yourself. 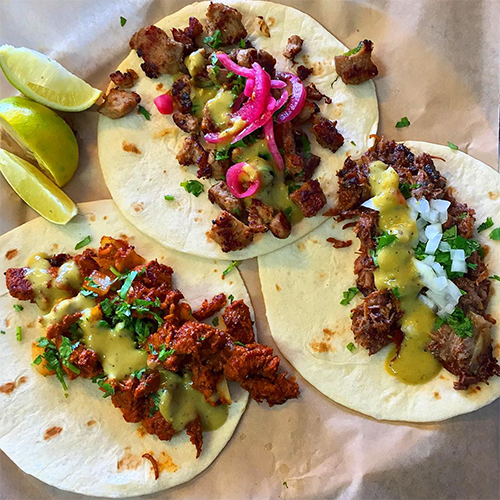 These guys do simple tacos with great ingredients and do it right. Everything on this menu I could recommend with confidence. Street style tacos done fast and super tasty. The pastor is my favorite as the pork is done with a pineapple huajillo rub and then grilled to order. Traditional flavors with the sweet from the pineapple and the mild spice in the rub. This is served with onions and cilantro. I like to order over a corn tortilla and sliced avocado on top of it with a mix of hot sauces. What ever you choose here tends to be delicious whether on corn or on flour. These guys do tacos right! Located off South Lamar Blvd or up north on Research Blvd. There you have it. Now go! Eat.